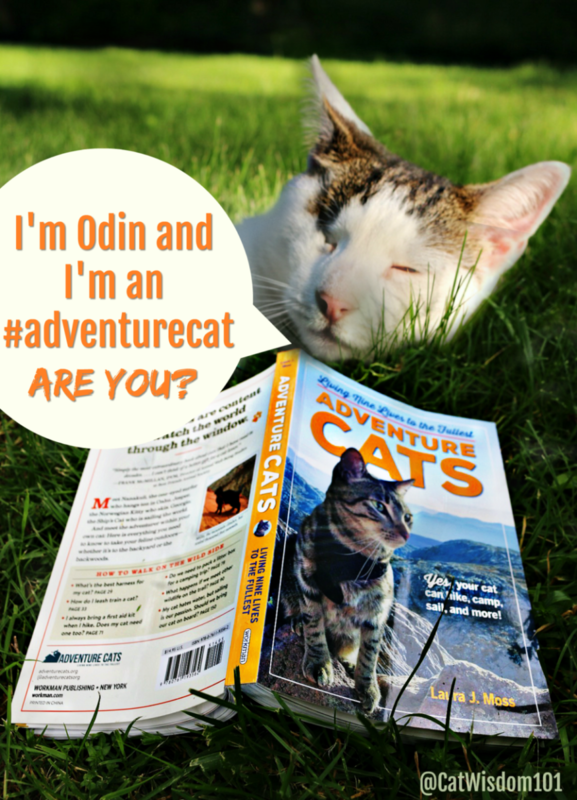 Ours cat don’t mind taking a break from our usual Monday post for this treat: Adventure Cats Q & A Plus Book Giveaway for Adventure Cats: Living Nine Lives To The Fullest. When we discovered Adventure Cats on Instagram last year, we knew we’d found kindred spirits. For the past six years of blogging at CatWisdom 101 we’ve espoused the advantages of safe, healthy outdoors adventure activities from leash walking in your garden and beyond. Cats are sensory sponges but especially thrive when using their sense of smell in nature. Odin, our adventure cat is super high energy and is not satisfied by regular interactive play or exercise. He craves the outdoors as much as any treat. Adventure cats is a fast-growing grassroots movement celebrating the full potential of cats exploring the great outdoors and bonding with their humans. Their Adventure Cats website is breathtaking look at cats who hike, go camping, sailing and kayaking like@BlackCatTrails, contributors to our book and our featured video today at our BlackCatsofIG Instagram account today. Cats are moving into a lifestyle previously held by dogs and many cats enjoy their outdoors adventure as much as dogs, if not more! That said, cats are not dogs and need proper prep for practical reasons. That means education and when Laura Moss, a journalist and co-founder of Adventure Cats announced she was writing a book, Adventure Cat :I reached out to her and she kindly gave a blurb or our book. It’s timely since our project was delayed, we’ve decided to expand it to over 100 black cats, including some amazing adventure cats. At the time (October 2016) Adventure Cats interviewed me for my expertise and I happily share the updated Q. & A. with you today. But first, if you’ve seen all the inspiring photos and videos of cats having the adventures of nine lifetimes, head over to Adventure Cat, look inside the book and purchase options. It is currently #1 on Amazon in cats. Like to win a copy? You will even you don’t have an adventure cat. The photos and stories about real life adventure cats is a delight. 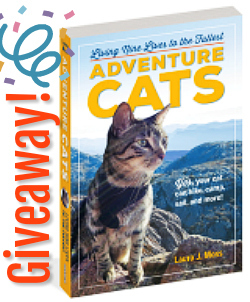 To enter, simply leave a comment at this post and our Adventure Cats will announce the winners next Monday. FTC: disclaimer: this post is not sponsored and does not contain affiliate links. We received a review copy from the publisher which in no way influenced our views. We only share content we feel is of value to our readers. Have an adventure filled week! Look for another fun giveaway this week and our blogoversery post! We’re on a blog hop and doing a shout for a Right Meow or Never a sassy southern mix of cat stuff, food, crafts , books, product reviews and grief support by a young mom and teacher. It’s a lot but seems to work and I thought I was busy! Want to train one of my five cats to walk with a harness and leash. I find the harnesses that go around the neck with velcro for adjusting and fastening are better because the cat can’t slip out of them. Just can’t figure out which cat might want to be an Adventure Cat. See which cat takes to wearing the harness most easily. They need to get comfortable wearing it before going outdoors. These are good questions. They may not even want to go be outdoors, let alone be adventure cats. I agree about needing flea/tick protection but there are natural options. The diatomaceous earth is working well this year with no fleas but not as a complete repellent for ticks. However, they quickly weaken and easy to remove. There pros and cons with every choice. Good question everyone should ask. I’m increasingly concerned about toxic chemicals in topical flea/tick products and relying on Diatomaceous Earth Food Grade powder (85%+ natural silica mineral) So far no fleas and ticks don’t embed and are easily removed. I’ve had an Adventure cat in the past, but my household is all about the indoors right now. That must be a great book! Goro walks on leash and goes to park or shop sometimes. Niko doesn’t like leash, so I’ve been thinking about getting stroller-but not sure, it might still be frightening for him…! I like that you respect their differences. They look similar but they are so different. My 3 blackcats love adventures! Our big adventurer is Ledges who goes canoeing, camping, and hiking with us. It would be great to read about all the cat adventurers in this book. I love following Adventure Cats on Instagram! My cat, Tully, doesn’t like to wear a harness so she’s not an Adventure Cat, but she loves to watch the birds from her window! I’ve got 2 adventure cats myself, with a third in training! We’d love to win a copy of this book! We would love to be adventure cats! Unfortunately our adventures would have to be indoors. My two rescued feral cats took many adventures with us to our cabin in the mountains, until Amber couldn’t tolerate the altitude. They also went to Oregon with us but wanted to chase ‘ghosts’ all night and that ended that! Now their adventures are as ‘muses’ in my latest novel, Black Cat and the Accidental Angel where Amber plays Angel and Truffie plays one of the kittens. Adventures still, but only in our imagination. Your book sounds great. Meow there. I’m Sneaky. I’m a library cat character in the Cobble Cove mystery series where I go on lots of adventures. 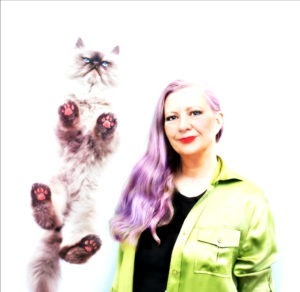 I also have my own blog where I interview real life and other cat characters. I’d love to win your book and maybe feature it on my blog, too. Have a purrfect day and thanks for the offer. Hi we are two brothers, one of us is black the other one is a bengal. We are both adventure cats, we are very curious and we love exploring and discovering our surroundings. Sumak the bengal goes out every day with his human and gets into adventures, chasing birds, climbing trees and poking his nose into bee nests 🙂 We would love to win your book! Our cats (the inside ones) are not adventure cats unless you count the adventures of singing to the feral kitties though the windows or the bottom of screen doors. We have a new addition BTW to the colony. And he is already neutered! He is fitting in nicely now, although Punchy still takes punches at him when he strays too close. His name is Floki. He seems to be bonding with Itty our deaf feral who isnt a true feral as he allows handling and petting. Floki himself although with an ear tip wasnt always a feral either……. so sad as he is a beautiful boy who craves attention and flops for belly rubs. He should make Itty a fine friend, as they both are adventure cats taking walk abouts. I hope you are doing well. I alway look forward to Monday even though sometimes it is your Tuesday when I get here! Congrats on your new member! I can’t wait to hear more. Is Floki black? Message me. I’m an adventure cat in and outdoors. Going to get this book! Guess I’ll wait to see if I win. ? Unfortunately, my Geddycat is not necessarily an adventure cat. His idea of adventure is meowing at me when I’m outside on the patio. When I take him outside, he’s okay for a few minutes until he hears one of the neighborhood dogs bark…LOLOLOLOL!!! Up until a few years ago, I had no idea cats could be leash-trained. That would have come in handy when my Pudi (as in “I tawt I saw a puddy tat!) was still alive. She was so anxious for adventure, she could tell when my arms were full as I climbed the stairs to my second-floor apartment, and then, she would scamper outside and disappear. She would have benefited from leash walking. MY cats are not adventure cats, but it looks like a good book. We have different places to have adventures: We have our lake house on the island – that’s our favorite, because we can loll around on the screen porch and watch the birds, bugs, squirrels and chipmunks go by. And we like the cabin in the woods because there are SO! MANY! WINDOWS! it’s like being right outside. And there’s a really really really old old house that’s OK but not as comfortable but we do have a nice napping spot in the upstairs hall window. Sometimes our humans take me (Buddy, the mature guy) out for walks on the grass, but my girlfriend Lucky is too quick to go out so she has to be happy with the windows. Mao is definitely an adventure cat. Ched is more of a homeboy, but growing up all our cats were indoor and outdoor cats. They caught birds and mice, then proudly brought them home to show off their accomplishments, then curled up to watch TV and sleep with me. This is so cool. We just “discovered” Adventure Cats just the other day! We would love to win the book! We would love to have a crew that could take on adventures. LOL we have our reading glasses on! I was pondering an adventure cat with a cat somewhere in my future–this might be just the thing to inspire me to try it. guyz…thiz book soundz awesum !!!! R grate add venture inn cloodz goin inta de garage N sum times gettin in de car 😉 ♥♥ we knead two tell R pals at kitty cat chronicles a bout two dayz post !! We are naughty and make our own catventures by sneaking out the doggy door…into the fenced yard. Then that gives petcretary an adventure trying to get us back inside. Esp when we do this when she comes home from work, late at night…Pipo was on the front porch one night, relaxed and watching the moon or whatevfur! We have adventure cats…backyard adventures, that is! Angel and Chuck are allowed outside when a human is with them, and they really enjoy eating the longest blades of grass that they can find. And you know what happens when they get back inside! Yep, upchuck-a-rama! LOL! I’m afraid my idea of adventure is staying at the Algonquin, home of Matilda! But then, my human is not particularly outdoorsy, so we mainly have indoor adventures, like at airports and hotels and hospitals and colleges. That’s enough for me.